McKinney is a mid-sized city located in the state of Texas. The city has a population of 156,821 residents. At 79%, the majority of the McKinney population is White; this is followed by 11% Black and 5% Asian. McKinney has a high percentage of people who are married with children when compared to the rest of the country. In total, more than 81% of the population is classified as married and 44% have kids. If you’re considering relocating to any new city, it could be a very daunting task. However, it could also be a great experience if you are willing to get to know the town before actually living in McKinney, Texas. Finding the best places to live in McKinney and nearby areas is a much easier task when you can rely on information and data from the livability score, which includes amenities, crime, weather, education, housing and other important metrics. McKinney, TX receives 91/100 for its livability score; this results in a ranking of #23 in Texas and #30 in the USA. Compared to the national average, McKinney ranks among some of the best places to live in the country! The cherry on top is that McKinney also ranks in the top 10 percent of all cities. Based on the grades for each individual category, McKinney has received high marks for amenities (A), crime (A), weather (B), education (A+), employment (B) and housing (A+). Conveniently located amenities and interesting attractions are a great way to continuously enjoy McKinney on a regular basis. Knowing that there are an abundance of amenities and things to do can ensure that you always have access to nearby grocery stores, restaurants and coffee shops. Some of the notable things to do include: McKinney Main Street, Heard Natural Science Museum & Wildlife Sanctuary, and Landon Winery. Crime rates can be the deciding factor for anyone looking to relocate to a new area. McKinney gets top scores for their low violent crime rates of 148 crimes per 100,000 residents, which are significantly lower than the national average. School test scores can be an important metric in deciding if the local area schools can provide a solid educational system for children. The schools in McKinney have a test score average of 81%, which is well above the US average. For buyers, real estate will be the largest purchase they ever make and it will also be their most valuable asset. For renters, the monthly rent paid on their McKinney apartments will most likely be their largest expense. 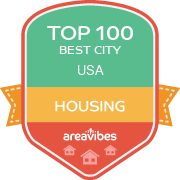 Based on tangible metrics like home and rental affordability and appreciation rates, housing in this area has received a score that is well above the average of every other US city. Certain items on your wish list like shopping, restaurants, nightlife and proximity to public transportation are all important factors to search for. Having said that, perhaps the most important metric to consider when contemplating a move to McKinney is real estate affordability. The median home price for McKinney homes is $228,500, which is 60.1% higher than the Texas average. If we take a closer look at the affordability of homes in McKinney, we’ll see that the home price to income ratio is 2.7, which is 3.8% higher than the Texas average. For most people, purchasing a new home is the biggest investment they will make in their lifetime. Taking a look at overall real estate appreciation rates in McKinney will offer some insight into determining if your home purchase will be a solid investment for years to come. In McKinney, the year-over-year appreciation rates were 3%, and the 5 year appreciation rates came in at 9.4%. How Do You Rate The Livability In McKinney? I really enjoy living in McKinney, as there are many things to do. One of the main reasons why I love living here is the weather. The summers are nice and hot while the winters tend to be very mild and comfortable. The community here is laid back and it is a very safe place to live. I also love living here due to the many great restaurants that I live near. Most of the restaurants I live near are located around W Louisiana Street. One of the restaurants I always go to is Rick's Chophouse, which is one of the best steakhouses in all of Texas. The nightlife could be a bit better but there are some nice bars in the downtown area. I find that most of the bars overcharge for drinks and they can be way too busy. Main street in McKinney is located in downtown and there are quite a few cool shops there. There are awesome antique shops. clothing shops and specialty shops. The Antique House is my favorite antique shop to shop at. I really enjoy living here and there is always something to do around here. Some of my favorite attractions are museum and wildlife sanctuary, the Landon Winery and the Chestnut Square Historic Village. All of these locations are located right in the center of the city. I really do not have anything bad to say about the city but I do wish that there were more bars and clubs to go too but other than that the city is the perfect place to live. If you are thinking about visiting or moving to McKinney, then you should definitely do it because the city is safe and very fun to visit and I plan on living here for many years to come. Source: The McKinney, TX data and statistics displayed above are derived from the 2016 United States Census Bureau American Community Survey (ACS).